We need to talk. You know that monthly newsletter you blast to your entire database under the guise of “lead nurturing”? And those Webinar invitations that you broadcast to every trade show lead you’ve generated since 2005? 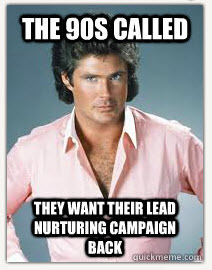 There was a time when lead nurturing was synonymous with simply staying in front of prospects. Call it “calendar-based” nurturing: a series of regularly scheduled emails, promoting different content, all to the same list. That might still be an effective way to maintain brand awareness, but by themselves these programs qualify as “lead nurturing” only in the most basic sense. 1. Campaigns based on selling stage. Ultimately nurturing should be about moving a prospect along the selling cycle. But a prospect in the early research stage has very different content needs than someone closer to a final decision. Consider creating campaigns designed specifically to focus on early, mid- or late-stage prospects. 2. Campaigns based on behavior. With today’s marketing automation platforms, you can trigger automated, multi-step campaigns based on virtually any measurable, Web-based behavior. Consider developing a campaign based on visits to key, high-value Web pages, or for prospects who download high-value content. 3. Segment by persona or industry. It’s the rare email that appeals to every name in your database. Your message has a better chance of success if it’s targeted and relevant to an individual’s buyer persona or industry. Consider segmenting your nurturing campaigns into key categories like user, influencer, and decision-maker. Or target campaigns by key verticals. 4. Campaigns based on product interest. If your company markets different products, it doesn’t make sense to be delivering the same message to everyone, regardless of interest. Consider developing campaigns that are segmented by product interest based on prospect behavior such as Web visits, Webinar registration, or content downloads. 5. Stay in touch campaigns. Typically, if a prospect tells one of your reps to call back in 6 months, the most that happens is a task gets set in the CRM system. But what if that one call was complemented by a carefully crafted sequence of emails timed according to when the prospect anticipated his/her needs changing? This entry was posted in B2B Marketing, Content marketing, email marketing, Lead Management, Lead Nurturing, Marketing Automation and tagged Content marketing, Lead Management, Lead Nurturing, lead nurturing agency, lead nurturing best practices, lead nurturing strategy, lead nurturing tips, Marketing Automation on August 15, 2012 by Howard Sewell. The right place, right product, right time–that’s what lead nurturing campaigns need to take into account. There doesn’t have to be a one size fits all campaign. You’re better off creating multiple campaigns that reach a smaller, yet more targeted audience. Great suggestions for alternative ways to think about lead nurturing. Differentiating campaigns in more targeted ways also helps marketers determine what type of content will be the most valuable when you do reach out. I’d also like to add that company size may play a factor in nurturing as well. Larger companies may have differing desires than smaller ones, and nurturing programs have to ensure the message will resonate with the recipient. Segment, segment, segment!